Perimeter fence walls include residential developments, military compounds, utilities and more. StoneTree® Perimeter Fence Walls are designed to keep intruders and prying eyes away from the area being protected. StoneTree® Fence Walls serve as effective noise reduction barriers. 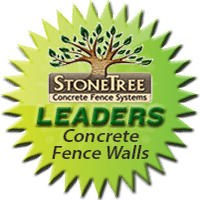 StoneTree® Concrete Fence Wall Systems, developed by AFTEC, LLC, the Worldwide leader in designing and manufacturing concrete fence forming systems, are used for residential, commercial, industrial, community and public works applications. When the management of AFTEC entered the concrete fence market, precast fence wall panels were still being horizontally cast with a molded texture on one side only, leaving an undesirable, plain appearance on the non-textured side of the wall. The StoneTree® product name was branded by AFTEC as their initial integrally precast panel/column Combo-Cast™ fence wall. StoneTree® Fence Wall Panels were first sold throughout the United States Mountain West, and quickly became the leader for quality and excellence in the decorative concrete fence market. Due to the popular demand for the unique StoneTree® Product and its ease of installation, the product line is now available worldwide. If you would like to learn more about StoneTree® Fence Walls or the possibility of becoming a Licensed StoneTree® Manufacturer, contact us here.